DragonPOS runs from the browser (i.e. Chrome, Internet Explorer 11), simply open a new tab and launch instantly. Try any of DragonPOS's plans free for 15 days or until you're ready to activate your account. Is there a setup, license or workstation fees? No. There are no setup or license fees on any of our plans. Use as many workstations as you like with no extra charges. No. You can sign up and use DragonPOS for 15 days without entering your credit card details. During my trial how do I change to a subscription? When you're ready to start your subscription on a paid plan, simply click the Activate button at the top of any page. Sure! You can change at any time to whatever plan best suits your needs, just contact our office, we're here to help. We accept Visa, MasterCard, Discover and American Express. At this time we can only accept online payments. Not at all!! You can try DragonPOS with no commitment. If you choose to activate your account to a paid plan, you pay monthly and can cancel at any time. There is no commitment and no long-term contracts. Is DragonPOS compatible with my existing hardware? DragonPOS has great hardware bundles available. It's also very likely that DragonPOS will work with the printers, scanners, credit card readers, and equipment you already have. But to be sure, swing by our Recommended Hardware Page for detailed specs on the hardware, peripherals, and computers compatible with DragonPOS. Can't find your existing hardware on our list of recommendations? Contact our sales consultants at Sales@DragonPOS.com or sign up for a free account and see how DragonPOS works with your store's existing hardware. I have a website but it's not that great - can you help? With DragonPOS you can create a fresh beautiful website with our easy to edit designs. In just a few minutes your new site will look great on any device, especially smartphones and integrate directly to your point of sale to do everything you've always wanted to accomplish. We've built our eCommerce so you don't have to be a web expert to run an amazing online store. And don't worry, were more than happy to walk you through the process of implementing your new site. We're talking exciting stuff here! I have a domain name but no website - what do I do? Don't worry, once you've chosen and designed your website with DragonPOS, we will provide you with a instructions for your domain provider. I love my existing website, can DragonPOS integrate with it? Sure! Once your signed up with DragonPOS, we will provide you with a simple link to add to your website so customers can access all your new features like online sign up, scheduling, order management and more. I have more than one store, will DragonPOS work for me? Yes, indeed. DragonPOS works great for retailers with multiple locations and it makes it easy to unify your delivery customers, payment and scheduling. I don't live in the USA, does DragonPOS routing work in my country? Currently DragonPOS mapping, routing and systems work in the United States and Canada. Feel free to contact us for other area availability. I've been using the same merchant processor for years, can I still use it with DragonPOS? Yes! You getting paid is very important to us, which is why DragonPOS works with most leading payment processors. Alternately, DragonPOS can also provide you with a great low rate merchant account inclusive of an electronic gateway for seamless integration both at the counter and online. How can I see DragonPOS in action? Go ahead take a free trial! We love connecting with new retailers and sure you'll love DragonPOS. Sign up for any level you want and use all or some of the features, it's up to you. I don't want to spend a fortune, how much does it cost to use DragonPOS? We don't want you to spend a fortune either which is why DragonPOS has a tiered pricing model where the costs depend on how big your business is and what you'd like to accomplish. Plans start at US$49 per month and can go up to US$99 per month (if billed annually). All plans include no set up fees and no license fees! I'm a very busy person, how much time does it take to set up DragonPOS? 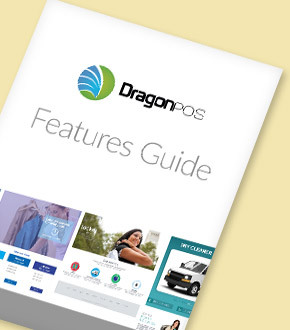 For more info, you might want to check out DragonPOS's POS Features Guide where we provide more information + checklists of what you may need when choosing and setting up your POS. If you need someone to walk you through the process, just get in touch with us and our support staff can assist you. I'm already comfortable with my current POS system, is DragonPOS really a better option? Most people who switch to DragonPOS never look back. Merchants love the software's user-friendly and intuitive interface, as well as its features and integrations. However, we understand that each business is unique and not all features may be a good fit for you. That's why we invite you to take a tour of our software and see if it meets your needs. You getting paid is very important to us, which is why DragonPOS works with leading payment processors. If you'd like to keep your current processor you'll need a payment gateway that will connect with DragonPOS. Don't worry, we can help guide you with this step. Alternately DragonPOS can provide you with a great low rate merchant account, and can also analyze your current processing rates to save you money! I don't like to get stuck if I have questions, can I call your support team time? DragonPOS phone support is available 9am to 6pm est, Monday through Thursday and Friday from 9am to 5pm est. Email support is free with all trial and billed subscriptions so you can send us a message whenever you get stuck. Priority phone support is included for free with Route Builder and eCommerce subscriptions, and available for the Retail plan at US$19 per month. Yes, DragonPOS can help your franchise businesses improve productivity and significantly cut costs. Find out how. I don't feel comfortable with web-based solutions, is my data safe in the cloud? Relax, As far as crashes or outages, our entire server is backed up to the hour so in the (again, highly unlikely) event that something goes wrong, your data will remain safe. If anything, your data is actually safer when you store it in the cloud compared to saving it locally. Why? Because in case (knock on wood) something happens to your devices (i.e. you get the blue screen of death or they get stolen) you'll still be able to access and take control of your information using other devices that can log into DragonPOS. I like DragonPOS but don't know where to start, what should I do next? Talk to us! Really. We'd be happy to discuss your questions or concerns so you can make the right decision. Call us at 877-241-3724, email Sales@DragonPOS.com or schedule a free one on one demo appointment.